A few years ago we reviewed a souped-up NES clone called the Analogue Nt with a prohibitively expensive, $500 aluminum housing. It was a beautiful piece of hardware, but ultimately it only served to remind my coworker Adam Clark Estes of just how basic and boring 8-bit NES games are. Nostalgia really needs a ‘your results may vary’ warning, because my trip down memory lane with the Super Nt, a souped up $190 SNES clone that works on modern HD TVs, instead reminded me how much I still love 16-bit gaming. 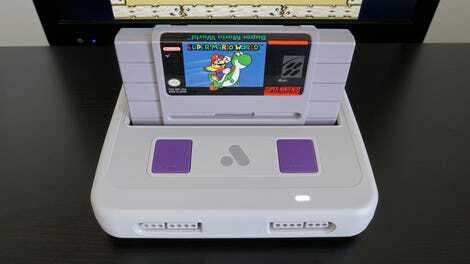 A souped up SNES clone that can play your old cartridges in high def. It's the absolute best way to play old games on a new TV. It is $100 more than an SNES Classic. With a footprint barely larger than a cartridge, the Super Nt is about half the size of the original Super Nintendo. 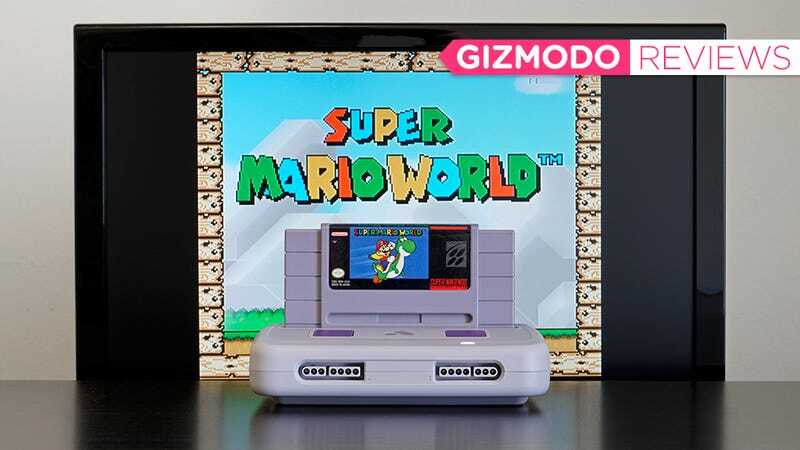 It’s available in four different colors, including all black and transparent plastic, but if you choose anything other than the original Super Nintendo or Super Famicom color schemes, you’re a monster—there’s no way around it. The Super Nt’s design, while clearly paying homage to the SNES, is far more streamlined and clean. I far prefer its minimalist look to Nintendo’s original hardware, but I do acknowledge the Super Nt benefits from decades of electronics miniaturization. On the top of the console you’ll find the SNES’ familiar cartridge slot, with spring-loaded doors to keep dust out, as well as power and reset buttons. The Super Nt is missing the SNES’ sliding power button which also served to lock cartridges while the console was turned on, but yanking a game out while the Super Nt was still running doesn’t seem to cause any damage aside from a frozen game. The minimalistic aesthetic is also carried around to the back of the console, where you’ll find just a single HDMI port, and a single microUSB port for power. That familiar cartridge slot—no blowing required. The Super Nt’s power and reset buttons. All consoles should have an easily accessible, rage-friendly, reset button. The back of the Super Nt is even more minimal, with a single HDMI port, and a microUSB port for power. On the front of Super Nt you’ll find a pair of controller ports, but the console doesn’t actually come with any gamepads. If you still have access to your Super Nintendo hardware, you can connect and use your original controllers with the Super Nt—but only if you prefer the authentic experience of wrangling annoying cords. Thankfully, Analogue has a better solution. The Super Nt works with both the original Super Nintendo controllers, third-party alternatives, or 8Bitdo’s wireless gamepads. In recent years Analogue has starting working with another company called 8Bitdo, known for its excellent wireless recreations of classic Nintendo controllers. So for an extra $25 (per controller) you can add a color-matched 8Bitdo wireless SN30 controller to your Super Nt. The 8Bitdo wireless gamepad includes a dongle you’ll need to connect to the Super Nt before the two will connect. Pairing is completely automatic so the dongle is a minor inconvenience, but I still would have preferred the Super Nt to have Bluetooth built right in so any wireless gamepad or controller could be used. 8Bitdo’s SN30 wireless gamepad is a perfect recreation of the Super Nintendo’s controller that actually improves on the original. That said, 8Bitdo’s SN30 is a perfect recreation of Nintendo’s controller. Its shape, its size, and the tactile response of its buttons all flawlessly replicate the feel of the Super Nintendo’s hardware. You’ll need to charge them from time to time, which is always a downside, but adding a pair of these to your Super Nt for $50 is a worthwhile upgrade. The Super Nt’s UI is even more minimal than the console itself. Functionally, the Super Nt works exactly like the Super Nintendo did, save for a menu the console boots into at power up. Its minimal UI makes you wonder if the hardware has actually crashed, but it doesn’t take long to figure out how to launch a cartridge, or the included copies of Super Turrican 2, and Super Turrican Director’s Cut. Digging a little deeper also reveals a robust settings menu. You can not only customize how the console functions, like skipping a short boot-up animation, or immediately launching whatever cartridge you have inserted. You can also tweak the audio settings, as 16-bit soundtracks sound fantastic through the Super Nt. (Going left to right, starting in the upper left corner.) Super Mario World with default rendering settings, with interpolation turned on, with scanlines added for a retro effect, and with a bizarre X-ray filter applied. Even more useful are the video settings that let you customize how your games look on an HDTV. I prefer the pixelated look of 16-bit games, and was content with the Super Nt’s default settings. But you can activate interpolation and pixel smoothing if you prefer less jagged results, or fake scanlines to recreate the look of an old CRT TV. There’s even an X-ray effect which turns SNES games into crude black and white drawings if you’ve ever wondered what gaming in the 1920's might have looked like. If there’s one feature lacking from the Super Nt, it’s games. Unlike Nintendo’s SNES Classic Edition, the Super Nt only has two titles included. It’s mostly a BYOC(artridge) affair, and if you got rid of your 16-bit games years ago, you’ll need to head to eBay and buy up used copies of your favorites. But thanks to an SD card slot on the side of the Super Nt that’s officially there for firmware updates, a lack of games might soon not be a problem. The Super Nt’s SD card slot, used for firmware updates, might open up some wonderful additional functionality. The more expensive Analogue Nt suffered from the same limitation as this Super Nt, requiring gamers to provide their own NES and Famicom carts to play. But a developer who goes by the name ‘Dragonstomper’ ‘Kevtris’, aka Kevin Horton, on the AtariAge forums posted an alternate firmware they developed allowing the console (and the follow-up Nt mini) to play downloaded ROMs. The added functionality all works through the Nt mini’s SD card slot, and while the alternate firmware isn’t officially supported by Analogue, the company had this to say about the possibility of similar functionality being developed for the Super Nt. In other words, it doesn’t sound like the Super Nt’s firmware includes any added roadblocks to prevent alternate, ROM-friendly firmwares from being developed for it. Cool! It’s hard not to get hooked on Super Mario World all over again. Please send help. At $190, the Super Nt is over $100 more expensive than the SNES Classic Edition, without controllers. With two BitDo controllers it then jumps to $240—$40 more than the original Super Nintendo cost in 1991. In all honesty, if you’re a passive gamer with a few fond memories of playing the SNES as a kid, Nintendo’s all-in-one console is probably all you need to scratch your nostalgic itch. But if you find yourself emulating and playing 16-bit games on your mobile devices a lot, and still have a big collection of SNES carts buried in a box somewhere, the Super Nt makes it so easy to enjoy them on a big screen, in all their pixelated glory, that’d you’d be silly not to get it. If you still have a Super Nintendo cartridge collection, the Super Nt is undoubtedly one of the best ways to make your 16-bit games shine on a modern HDTV. A robust settings menu lets you customize how your games look and sound on a TV with far more resolution than they were designed for. At $190, without included controllers, it’s considerably more expensive than the SNES Classic Edition. Works with the SNES’ original controllers, but also with 8Bitdo’s SN30 wireless controllers, which are near-perfect recreations of the Super Nintendo’s gamepads—but better. Out of the box it can only play your favorite games if you have the cartridges for them. But there’s the potential for alternate firmwares that can load ROMs via the Super Nt’s SD card slot. No built-in Bluetooth limiting which wireless controllers can be natively used with it. Correction 12:43 p.m. ET: This post has been updated to correctly identify the developer responsible for the alternate firmware available for the Analogue Nt mini, not the original Analogue Nt, as Kevtris, also known as Kevin Horton, who’s also responsible for designing the Nt mini’s electronics.